The painting of Bosch - St Jerome in Prayer illustrates the contrast between good and evil and between the spirit and the flesh - the principle on which medieval morality was founded. 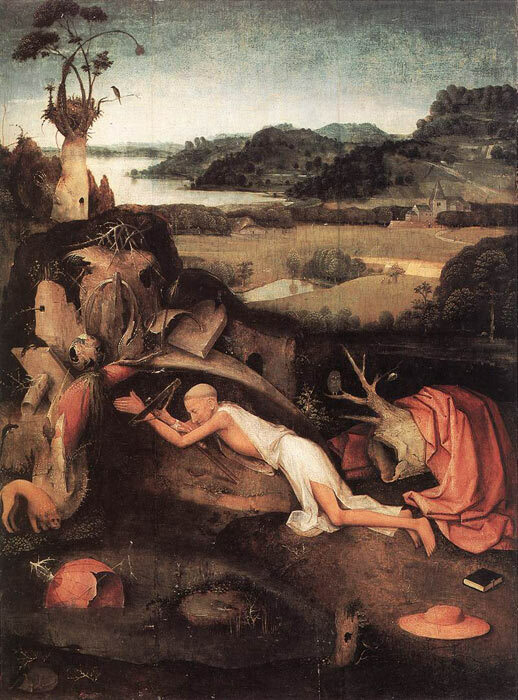 Bosch's painting contrasts Jerome's tribulations in the foreground with a serene landscape that flows away into the background and which is handled with great naturalism. The saint has prostrated himself before a crucifix and finds himself in a strange and poetic setting, full of symbols and attributes. The rocks and tree-trunks, displayed by Bosch are threatening and seem to have come to life, yet, even here, the overall impression is of great realism and lively detail. SPECIAL NOTE : The painter will make the reproduction as close to the original oil painting as possible. If you want your painting to alter from this likeness, please email us and " St Jerome in Prayer, 1505 " will be reproduced according to your special requirements.